After fighting off mutant aliens in last year's remake to The Thing and vintage bloodsuckers in this year's Abraham Lincoln: Vampire Hunter, it's about time we see Mary Elizabeth Winstead battle real life demons in a Sundance drama some critics are already calling her best performance to date. The movie, which took home the U.S. Dramatic Special Jury Prize for Excellence in Independent Film Producing by Andrea Sperling and Jonathan Schwartz, also stars Octavia Spencer (in her first film role since her Oscar-winning turn in The Help) and Megan Mullaly. It's directed and co-written by James Ponsoldt, in his first full feature film. I always thought Mullaly could do drama and not just the hilarious Karen on TV's Will & Grace, so it's exciting to see her a part of this. And it will be interesting to see what Spencer brings to this role, as I believe Hollywood has yet to see the best from her. Same goes for Paul, who stays putting in impressive work on TV's Breaking Bad but has yet to really grab the attention of a film audience. The movie promotions seem to be going hard on Winstead's performance, who've I've never been impressed with in the past, but I'm looking forward to seeing her work--as well as that of the entire cast in this film. 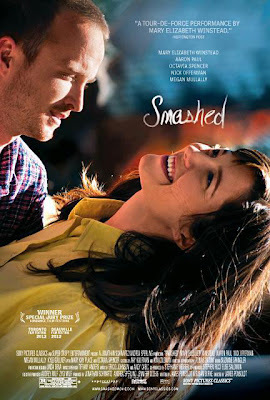 Smashed is slated to hit theaters October 12. I am actually seeing this film tomorrow night at TIFF. I've been looking forward to this since I heard about it at Sundance. The cast sounds great, and I'm ready to see Aaron Paul in something good outside of Breaking Bad. I've been so impressed by Aaron Paul in Breaking Bad, so I would love to see this one.